Our bodies produce a family of proteins that recognize and kill bacteria whose carbohydrate coatings resemble those of our own cells too closely, scientists have discovered. Called galectins, these proteins recognize carbohydrates from a broad range of disease-causing bacteria, and could potentially be deployed as antibiotics to treat certain infections. The results were published online Sunday in Nature Chemical Biology. Researchers at Emory University School of Medicine made the discovery with the aid of glass slides coated with an array of over 300 different glycans (carbohydrates found on the surfaces of cells) derived from bacteria, many of which are found in the intestine. One can think of these slides – called microbial glycan microarrays – as wardrobes displaying a variety of clothes worn by gut bacteria. "Many microbes cover themselves with glycans that somewhat resemble our own cells," says Richard D. Cummings, PhD, professor and chair of the Department of Biochemistry at Emory University School of Medicine. "That limits how well the immune system can use antibodies to respond to those microbes." To prevent auto-immune attack, our bodies usually don’t make antibodies against molecules found on our own cells. That leaves gaps in our defenses that bacteria could exploit. Several of those gaps are filled by galectins, the researchers found. The Emory researchers collaborated with the laboratory of James C. Paulson, PhD, at the Scripps Research Institute (TSRI). Co-first authors of the paper are Sean Stowell, MD/PhD (a resident in in laboratory and transfusion medicine at Emory), Connie Arthur, PhD (postdoctoral fellow at Emory with Stowell), and research assistant Ryan McBride at TSRI. In contrast to antibodies, the galectins kill the bacteria directly, without needing other parts of the immune system to pile on. The researchers identified several varieties of bacteria (Pseudomonas aeruginosa, Providencia alcalifaciens, Klebsiella pneumoniae, and Serratia marcescens, for example) targeted for killing by galectins. In some cases, only certain strains of a given bacteria were vulnerable, because only those strains carried the target glycan. "These studies have opened the way to understanding the ways in which adaptive or antibody-based factors work together with innate or galectin-based factors to give us immunity against a broad range of microbes," Cummings says. In addition, the microarray technology provides tools to study glycan-binding antibodies and galectins in populations, he says. "These studies use tiny amounts of blood – just a few drops – and show how glycan microarrays could supersede previous technology," he says. "Using these tools, investigators could identify developmental- and age-specific differences in anti-microbial glycan antibodies in humans, which may predict susceptibility to disease." The research was supported by the National Institute of Allergy and Infectious Diseases (AI050143), the National Heart Lung and Blood Institute (HL107151, HL085607), the National Institute for General Medical Sciences (GM103694, GM098791, GM62116), the US National Blood Foundation, the Swiss National Science Foundation, CSL Behring AG, and the Brazilian Ministry of Education. Reference: S.R. Stowell et al. 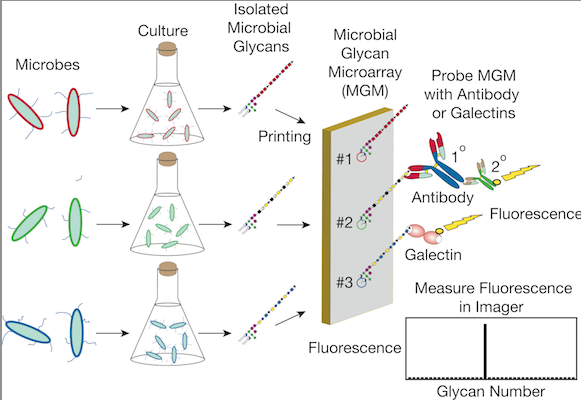 Microbial glycan microarrays define key features of host-microbial interactions. Nat. Chem. Bio doi:10.1038/nchembio.1525 (2014).